I haven’t posted anything for ages. Rella’s birthday came and went without a mention – even though we had a good barbecue (the sun shone) with lots of food photo opportunities. The vegetable kebabs were particularly attractive, having a chive flower adorning the end of each tomatoed skewer. Incidentally, chive flowers are better separated out into little florets and strewn over salads; they add an alliumy taste hit while looking summery and floral -very good in potato salad; but I digress. The bananas chucked whole onto the barbecue in their skins – OK, so they didn’t look so great – were mouthwateringly delicious. The chocolate cake Arlo made was good too – and Katrine made another Bolo de Milho. But it all passed without a mention. However, my posts have been proceeding at a subconscious level and this means that when I do get the inclination to sit at the keyboard and bear my soul (!) I am not short of material. Recently I have been doing a lot of painting. 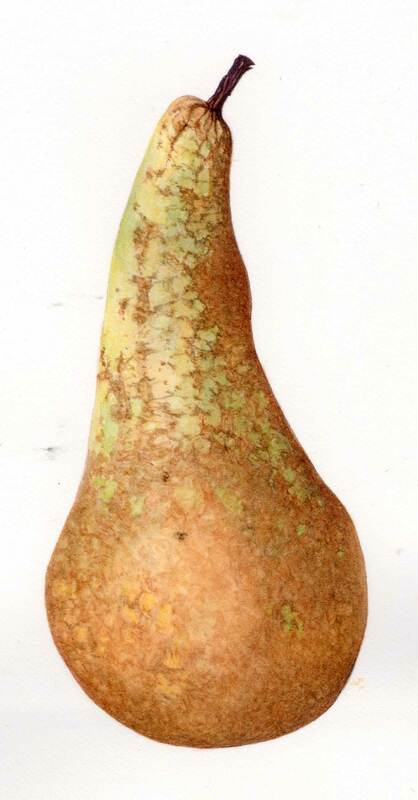 I’m working on paintings of pears. the last one I sold was called “pear trio” (Paul in Harlequin calls it 6 – there’s a visual joke there which may not work in words). It takes quite a bit of time to paint pears and, if I’m not careful, the pears go off (I like to paint from life). So I’ve had a few conference pears sitting going quietly too soft. It got to the point when I needed to eat them, but they were quite wrinkly. It’s no good buying things to paint only to watch them rot, so I thought I’d cook them in a cake. Katrine and I made a pineapple upside down cake which was very nice (one of those posts in waiting) and I thought a variation on the theme would work. Peel and slice three (or more) ripe pears into a well buttered, round oven proof dish/plate (about 9″ across). Sprinkle with a little cinnamon and sugar. 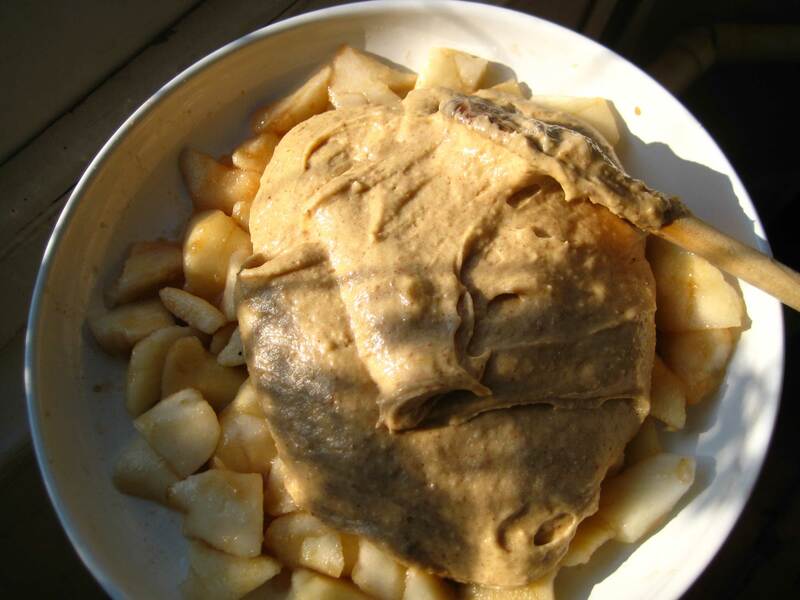 In a bowl mix together 3oz very soft butter, 3oz soft brown sugar, and two eggs. Beat well. Add 2oz ground almonds, 4oz self raising flour and enough water to make it a soft dropping consistency. 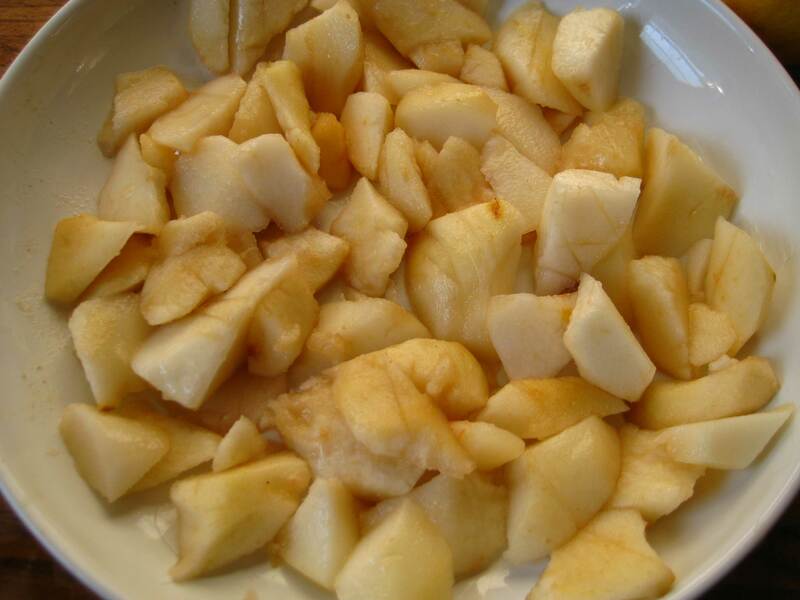 Mix in some more cinnamon if you like – it works well with pears – and them spread the mixture on top of the chopped pears. Bake for about 35 minutes at 160c – it should be brown on top. 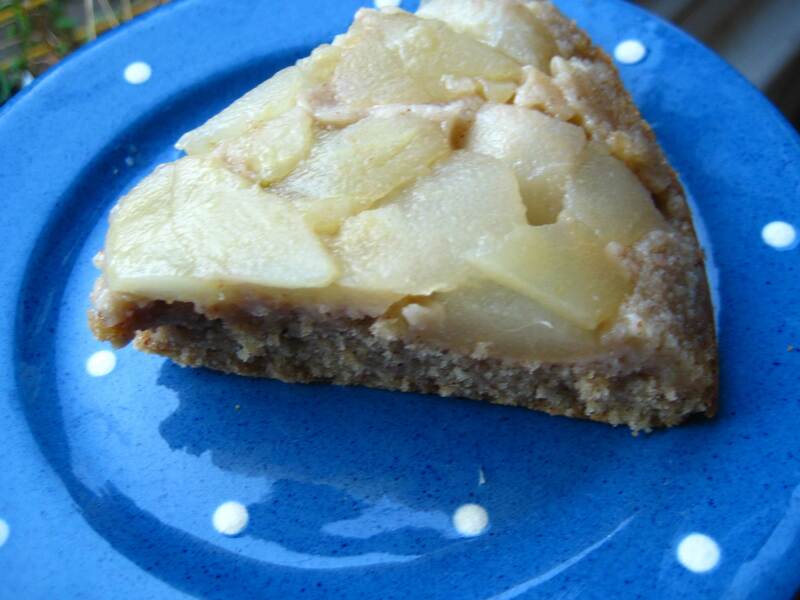 Leave to cool a little and then invert onto another plate so that the pear mix is on the top. Sometimes it’s quite liberating to let blogging opportunities slip by, I’ve been relaxed about that recently too. Beautifully detailed pear painting, the cake looks like a tasty biproduct too! Thanks. I think the sun being out makes a difference – we want to make the most of it.